It’s been quite a while since we last met and we miss you 😢 Unfortunately it will be some more months till we meet again. As you probably already guessed, we won’t do another TV Hackday this year. But there are also some good news 🎉 so let us explain. If all goes well we’ll return in the first half of 2018 with an all new event. 😆 Currently we call it “TV Hackday – building futures edition”. We’ll focus more on collaboration, on solving bigger problems, on storytelling and on getting an even larger audience for the amazing work that you do at the event. As you can see it’s not finished yet but this also means now is the perfect time to share your thoughts, questions and ideas or even become involved. 👉 So please get in touch, if you want to get involved or have an idea on how to improve the experience. We’d love to hear from you! PS: Want to be the first to know about updates? No spam, no thirdparties, just TV Hackday. We've sent you an email. Please confirm your email by clicking on the Link inside. The jury winner was FLIXRAY. Live Layers won the Ericsson Challenge and MOVIEPARTY the FUNKE Challenge. Congratulations 🎉👏. FLIXRAY augments reality using a smartphone. It recognizes the running program on a TV using smart image recognition technologies and surfaces additional information like trivia or cast. 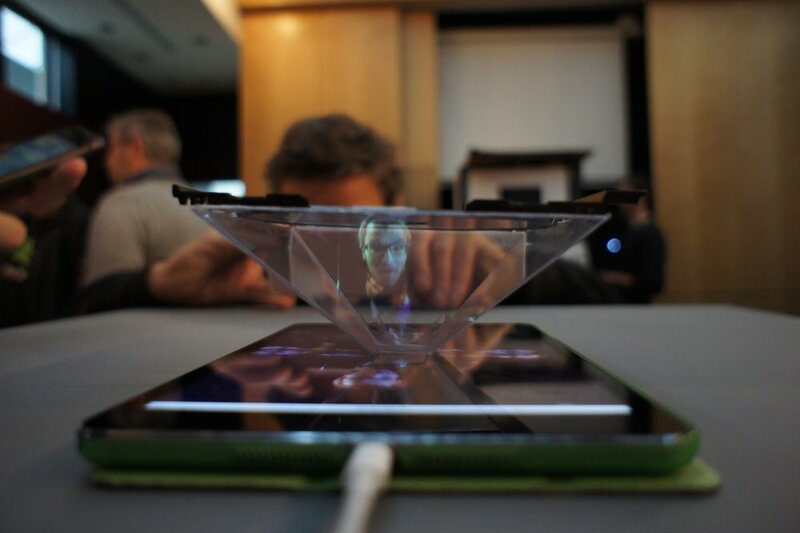 HolPad shows a live representation of a person that is in front of another HoloPad or Smartphone. The challenge was creating and manipulating the stream in real time so that the it can be shown on in as an holographic illusion. Live Layers enables viewers of live events in a VR-world additional information like stats or food options based on real time image analysis using Microsoft cognitive services, Ericsson Metadata and various recommendation engines. MOVIEPARTY gives you a recommendation for choosing the right movie based on the emotional reaction of the group in front of the screen. Using Microsoft Cognitive Services to recognize the emotion and FUNKE's Content Discovery API to serve the recommendation. ATLAS offers viewers a 360° drone race experience. Beginning in a waiting room users then get matched and start a live feed from the drone in 360° as the it races through the track. Hello VR visualizes TV-programs and film clips in VR as floating screen with a visual timeline of thumbnails in the room around the screen. VR Calligraphy takes users into virtual arte space. Artificial intelligence is painting artworks for users to enjoy based on 360° photos and famous artists. Match Ball surfaces TV recommendations based on subconscious emotional states represented in different colors. So the user get's the perfect offer for his or her mental state. We’ve had Contents, API’s and Devices from: funk, Panono, FUNKE Digital TV Guide, HTC Vive, ARTE, Cardboards, Wizart API and Microsoft Cognitive Services. funk is the first online-only offer from Germany's publicly owned media companies, ARD and ZDF. It is a multi platform network focused on video content targeting audiences between 14 and 29 years old. It is based on a powerful API that can be used to build products using all the contents funk has to offer. The API offers different endpoints, for instance for stories, video formats or analytics allowing for new services. Have fun playing around with it, have fun building something great with it. Panono is an integrated solution for professional 360° photography, providing a complete portfolio including high-end camera hardware with an app-based control system and a cloud-based service for fully automated stitching, hosting, and further applications for 360° images. 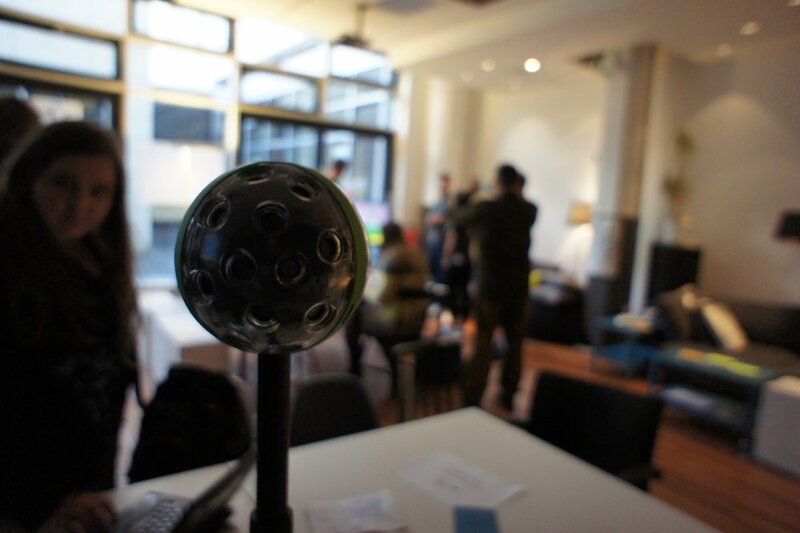 The Panono Camera is a ball-shaped, high-resolution 360° camera. It is equipped with 36 individual cameras that trigger simultaneously to capture everything in every direction in a single shot and deliver full-spherical images. With a total resolution of 108 megapixels, the Panono is the highest resolution 360° camera on the market. To get the AR & VR Experience going we'll have two complete HTC Vive Setups at the event courtesy to btk University as well as unitymedia. Also we'll have Google Cardboards for everyone thanks to the wonderful folks at Google. Microsoft will provide vision, speech, language, knowledge, and search APIs and support in order to get the AI part of the event started. These APIs include APIs like Computer Vision, Text Analytics API, Video API and Face API to just name a few. The Wizart API allows you to transform images into artworks painted by neural networks. It works best for entertaining / expressive / emotional / funny / communicative ideas. With over 70 styles in the API you are able to transform images to funny / artstic / spooky & horror / beautiful / creative results that can further be used for your great hackathon concept. Just upload, select the style, select output form. Ericsson will be providing their state-of-art, Content Discovery API which allows seamless integration & delivery of global TV/VOD metadata. In addition, Ericsson will provide subtitling data allowing you to further explore use cases beyond standard captioning services. way. Also ARTE will if all goes well provide access to 360° Videos to use in the AR & VR Environments. Here's our wonderful Jury that's gonna have a look at your projects. They cover a wide variety of different disciplines and backgrounds and will help us see the bigger picture in your work. Natalie is a Backend Developer at adjust. Prior to that she was part of the Silicon Integration team at Intel, and graduated with a B.Sc. in Computer and Software Engineering from the Technion. In her free time she organizes the Golang Berlin meetups, leads the Women Techmakers in Berlin and a sailor. MakeLab is Ravensburger’s open sandbox to explore creativity and play in the digital future. "anything you tell in any format can change somebody, can scratch an opening in a scared up heart of a human being — and it doesn’t matter how you do it." Along the way we have mentors that will help and guide you to get your idea done in the 24h. Felix Segebrecht, works as Innovation Manager at Unitymedia and has a lot of experience in product development and agile methods as well as digital transformation overall. Hackerbay is the world’s future research & development department. Hackerbay is combining American creativity and German efficiency with the fastest hackers. 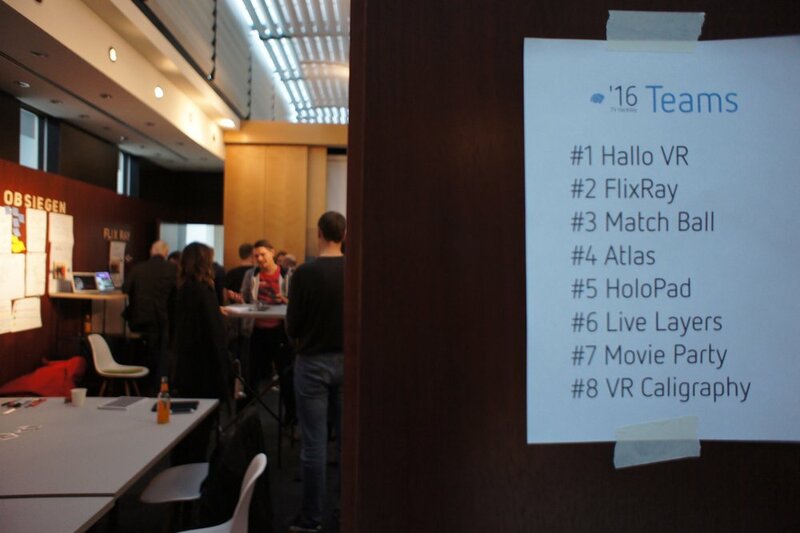 At TV Hackday, we’ll hack the future of TV. Creatives, developers, designers, concepters and TV Stations alike will work together to do remixes, apps, hacks or the next TV Set. Anything goes as long as it is a TV related project that can be done in 24 hours. TV offers a lot of possibilities to hack and with some brand new APIs that will be made public for the first time we'll have the opportunity to create something new & exciting. Besides having a fun two days, we will demo the resulting hacks on Sunday afternoon to participants, a jury and anyone else interested. The demos will be live steamed. Also there will be prizes!1! Developers, creatives, storytellers, designers, techies, strategists, producers, concepters and TV Fanatics! In short, everyone who loves TV and wants to make it even better. 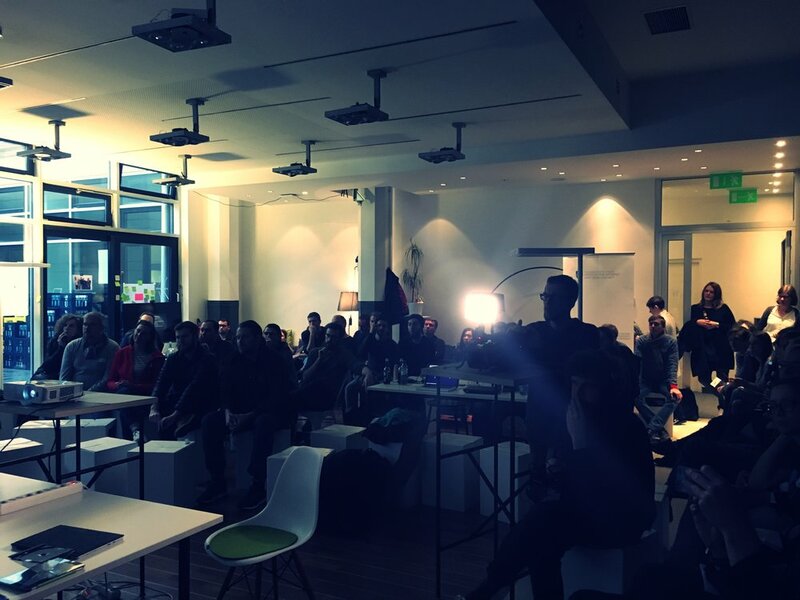 TV Hackday is an event by Medienanstalt Berlin-Brandenburg. Please note our Code of Conduct for the Event. TV Hackday is organized by Sebastian Flock from blackspark.digital, Csongor Baranyai & Bertram Gugel.